I love finding jewelry I like at a good price, and sometimes that's a difficult search. At Jewels By Park Lane, there's something for everyone--whether you're looking for inexpensive or fancy with many styles to choose from. They have watches, necklaces, bracelets, pierced earrings, clip-on earrings, rings, anklets, pins, and even things for men. I've seen prices as low as $8 and as high as over $400...so it's really a huge selection. Do you want to feel like royalty? Check out the amazing jewelry set that I received. We were sent the Romantic Necklace and Earrings, and they are so gorgeous! Both pieces have a dainty silver chain adorned by lacy silver filigree-capped white faux pearls and faceted clear Swarovski crystal beads. The necklace is 16 inches long plus a 3-inch extension. The best part is, you can look like a million bucks but not spend that much to look that way. And when you put them on, you truly feel like a princess. It's so refreshing to have a jewelry store with a huge selection and prices that are affordable. I can find gifts here for every female in my family and each of us has completely different taste. My mother and I are very feminine and love flowers. My sister, however, looks at flowers and gags but loves the color blue and "swirls". I could even buy something for my hubby! 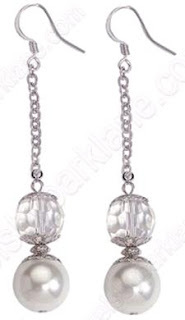 Cost: The Romantic Necklace is $37 ($$$) and the Romantic Earrings are $22 ($$$). Overall: We give Jewels By Park Lane a 10/10! If you'd like to buy something from Linda's Park Lane shop, for every purchase of $30 or more she will give you another piece of jewelry of the same value for only $12! Linda Parish, our Park Lane representative, was amazing enough to send me two $25 gift certificates to her store for a giveaway...except they somehow got lost in my house. *sigh* So, I will be giving away the Romantic Necklace and Earrings I received. Should I find the gift certificates (please pray), I will choose winners from the valid entries here--even if it's weeks or months from now--and send them out. You never know, so be sure to enter!! First, visit Linda's Jewels By Park Lane website. Then, comment here and tell me about another piece of jewelry you would love to have. 2) Make a purchase of more than $30 from Linda's Jewels By Park Lane website for 10 additional entries! 14) Vote for this blog by clicking each of the following icons for 1 additional entry per click (a total of 5 additional entries), and you can do this once per day and make sure to comment on all giveaways you're in! Make sure to comment 5 times every day that you click to let me know you clicked for each one. This giveaway will close on September 29, 2010 at midnight. We were sent a Romantic Necklace and Earrings from Jewels by Park Lane free of charge for the sole purpose of this review; no other compensation was received. All opinions expressed are my own. I like the Red Hot Pierced Earrings! I like the Juliet necklace. I like the Amaretto earrings. Another piece of jewelry I would LIKE to have is the Night Moves Watch. I like the two-gether necklace. I love the Creme de la Creme earrings! I like "The One Ring" too! I would LOVE to have the Cozumel Pierced Earrings. I subcribe to the twinners emails. Cherie necklace is really beautiful.